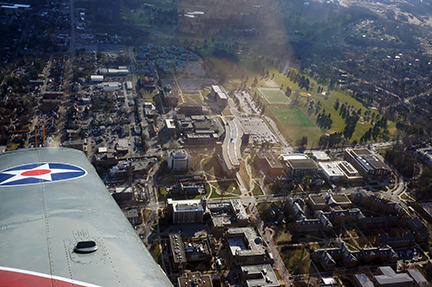 Miller Lecture with Rachel Pain |Campus fly-over | What about MOOCs? Aerial view of the west end of the University Park Campus showing Walker Building. Photo by Eun-Kyeong Kim. Roberto Albandoz (Ph.D.’11) and Thomas Sigler (M.S.’07, Ph.D. ’11) won a National Council for Geographic Education (NCGE) award for Best College/University article: “Beyond representation: Film as a pedagogical tool in urban geography.” Sigler is currently at the University of Queensland, Brisbane, Queensland, and Albandoz is an academic adviser for Penn State Word Campus. Anthony Robinson was interviewed by Class Central at the recent Coursera Partners Conference. As a result they’ve posted an article about his course and the Geospatial Revolution. Public Relations Intern Kathy Cappelli has taken a summer internship in Redlands, California, with the Global Art and Design Project. She will be managing their social media pages and planning fundraising events for the nonprofit, raising money for South African schools. Be sure to follow the Global Art and Design Project, or ArtDept on Facebook and Twitter! Chris Fowler and Leif Jensen (rural sociology) received a seed grant to study the changing geography of commuting regions in the U.S. from the Penn State Population Research Institute. Greg Milbourne accepted a GIS Analyst position with Dewberry in Fairfax Virginia after graduation in May. David Retchless accepted a tenure track job with Texas A&M, Galveston. Carolyn Fish was awarded a scholarship to attend State of the Map, the OpenStreetMap conference, in June at the UN. SYWIG Day, held on Friday April 10, was a success: 28 girls and five teachers came from Bellefonte and Moshannon Valley middle schools. Thanks to all the faculty, staff, and grad students who made this possible. This lecture interrogates the relation between intimacy and geopolitics, through the examples of domestic violence and international warfare. I explore four models of how this relation might be cast. Most recent work on violence in human geography has used the first of these models: focusing on geopolitics to the exclusion of the intimate. Second, where increasing attention is paid to the intimate, it is placed as lesser or secondary to geopolitics. Third, some feminists have analysed intimacy and geopolitics in a two-way relationship of equivalence. Fourthly, I ask whether there are grounds for positioning intimacy as foundational to geopolitics. University Park Campus in Pop Carte vision. Aparna Parikh received an Achieving Woman award in the graduate student category at the Commission for Women awards luncheon yesterday. Vincenzo Leone won the Marie-Curie research fellowship. This is two-year research award is among the most competitive and prestigious in Europe. It comes with generous funding to spend two years at UCL in London. Dana Cuomo has accepted the position of Student Advocate and Care Coordinator in the Health and Wellness Center at the University of Washington. She’ll be providing advocacy services to survivors of sexual violence, dating violence and stalking, and will continue to do research in these areas. The position begins June 1. Russ Hedberg had an article accepted for publication in the journal Landscape Research. The title of the article is “The Ecology of Alternative Food Landscapes: A Framework for Assessing the Ecology of Alternative Food Networks and its Implications for Sustainability,” and it will appear in a forthcoming special issue on food and the landscape. Emma Gaalaas Mullaney recently received the 2015 Dimensions of Political Ecology Graduate Student Paper Award, and the 2015 Women’s Studies Department Sara Woods Outstanding Graduate Teaching Award. This project investigates the news convergences of two essentialist and geographically centered representations of the white female body as a larger social, political, and cultural symbol of respectability in the new millennium. Specifically, this piece examines the rhetorical rise of the term “Stay-At-Home Mom” within news stories in relation to the disproportionate news coverage of white female victims at the turn of the 21st century, a phenomenon that professor Sheri Parks calls “Missing White Woman Syndrome” (MWWS) and scholar Rebecca Wanzo (Wanzo 2008) refers to as “Lost Girl Event”. After more than a decade of extensive research, the Historical Atlas of Maine presents in cartographic form the historical geography of Maine from the end of the last ice age to the year 2000. Organized in four chronological sections, the Atlas tells the principal stories of the many people who have lived in Maine over the past 13,000 years. The Atlas covers the history of Native peoples, European exploration and settlement, the American Revolution, Maine statehood, industrial development, and the rise of tourism and environmental awareness. To tell these stories, the Atlas presents a rich array of newly created maps, historical maps, paintings, graphs, and text. The result is not only a unique interpretation of Maine, but also a splendid visual record of the state’s history. Last week’s mystery dog was Dixie, companion to Claire Regan. Hannah Ingram was the first to provide the correct answer. Send a photo of your dog (or any animal companion) to geography@psu.edu for our mystery dog of the week!